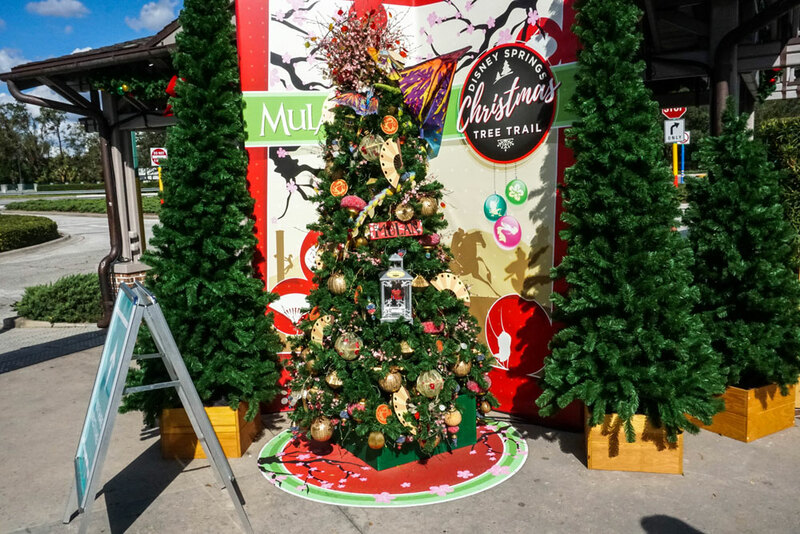 Christmas trees are not just a casual seasonal decoration, after all. To me, at least, they are a sort of secondary hearth, the centerpiece of the holiday home—an array of lights and baubles that glisten, sparkle, and shine in a brilliant spectacle that keeps the cold winter darkness at bay and reminds us of the brightness that is strung through each of our hearts when we are together. Corny, I know, but sentimentality is in style this season. My point is, to really enjoy a Christmas tree you’ve gotta see it at its most glorious: plugged in and illuminating the night. So, I waited patiently for the sun to say his goodbyes and skedaddle, and I headed back to the Trail to see just what a difference eight hours makes. 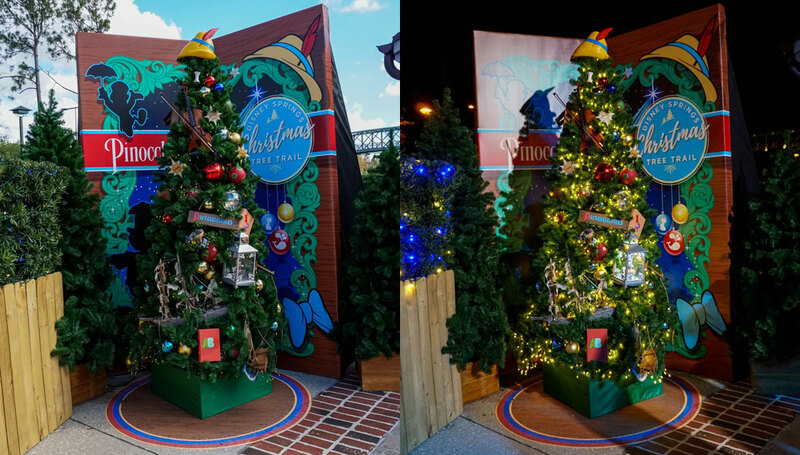 What follows are pictures of the trees you can expect to see at the Disney Springs event this year, both during the day and at night, so you can judge for yourself whether it might be worth it to postpone any visits till the evening hours. 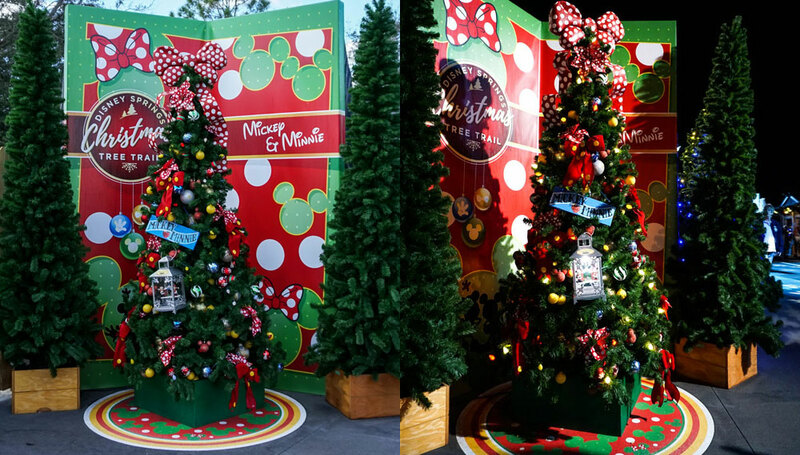 Mickey & Minnie: From this first example, you can already start to see that much of each tree’s illumination comes from spotlights meant to highlight both the display backdrops and any unlit decorations. 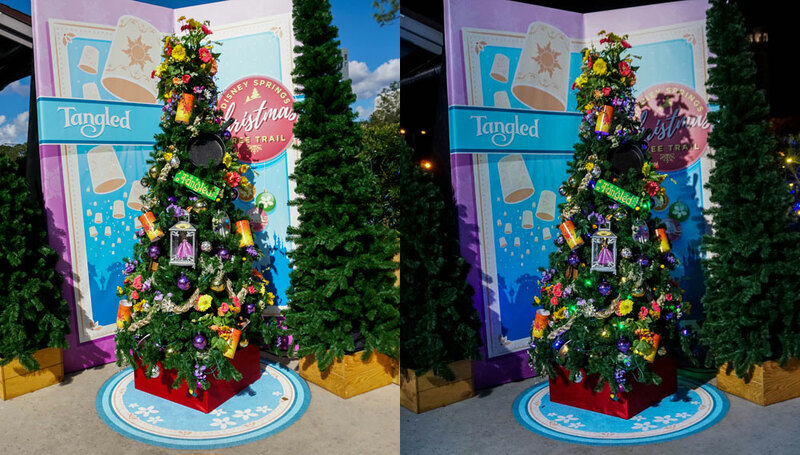 Of course, even without the backdrop, the tree topper and accent bows make the theme of this one unmistakable. 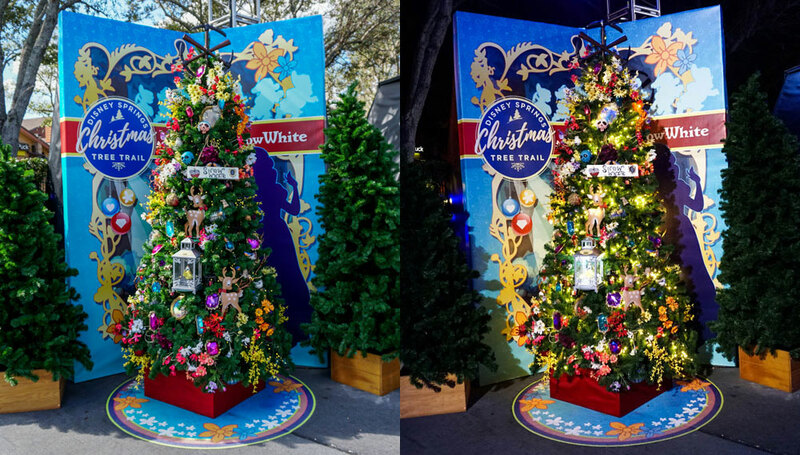 Snow White: While the lights do twinkle nicely at night, this tree’s floral decorations perfectly fit a daytime viewing. 101 Dalmations: Due to he heavy presence of white in its decorations and backdrop, the night sky gives this tree a dose of contrast that really makes it stand out. 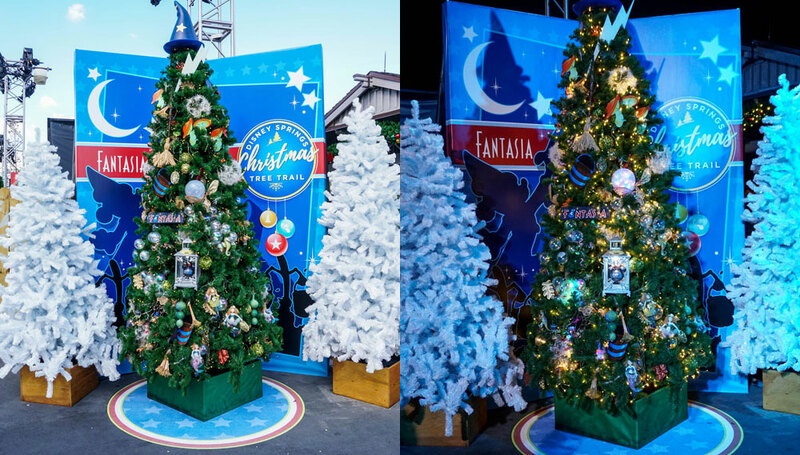 Fantasia: This tree was decorated with magic in mind, and that theme becomes truly noticeable once its lights have a chance to stand out. 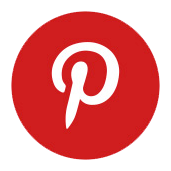 Pluto: Like Pluto himself, this tree is uncomplicated and lovable. 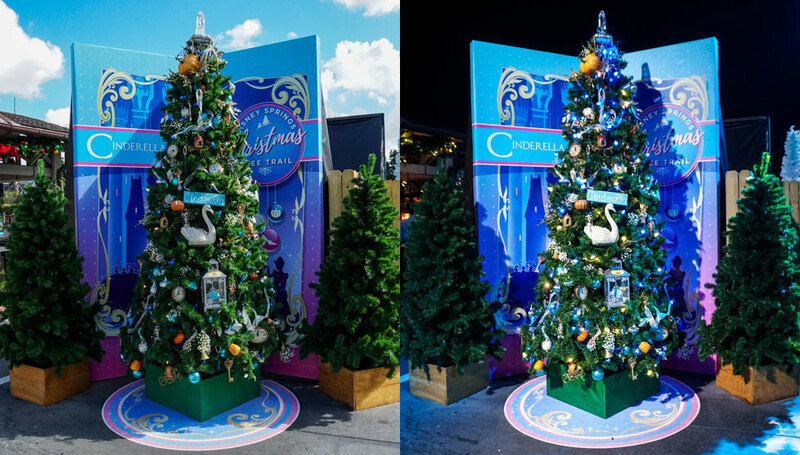 Cinderella: Although the blue lighting looks enchanting at night, if you view this tree during the day the glass slipper tree topper really catches the sunlight and shines all on its own. 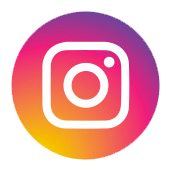 Tangled: This is another one with bright, daytime complimentary colors. Beauty and the Beast: While the rose red perfectly fits in with the story’s theme, it also creates a very traditional Christmas look. 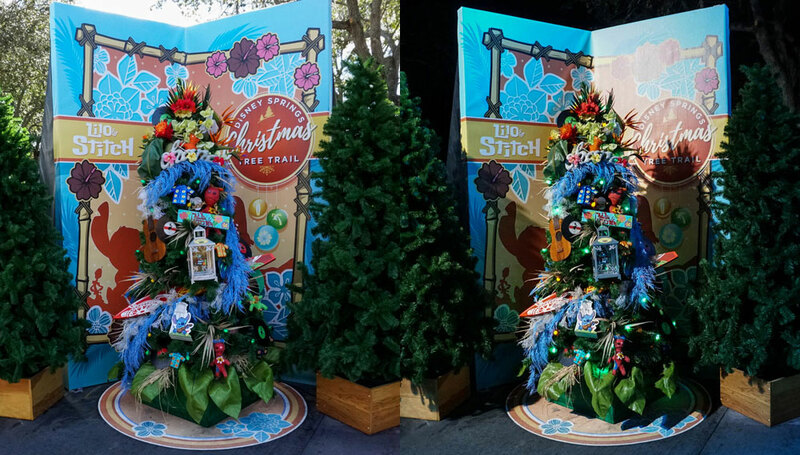 Lilo & Stitch: Yet another example of a great daylight tree, its unique garland really sets it apart. 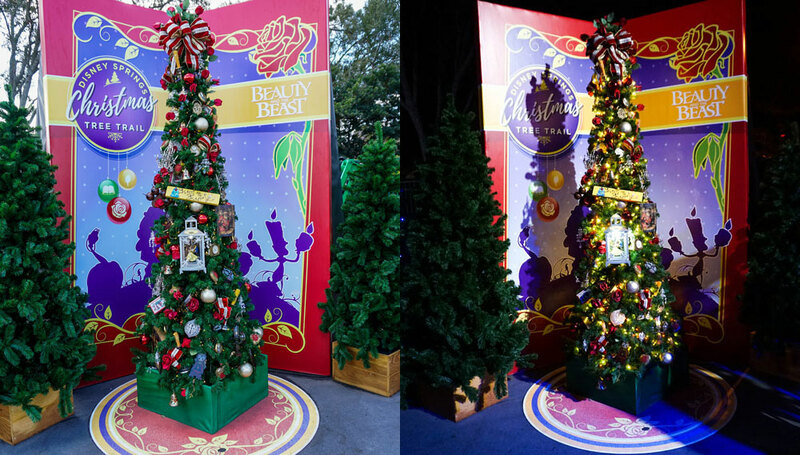 Sleeping Beauty: Although also very floral and daytime appropriate, the color of the lights and flowers work together to bring this tree to life at night. Peter Pan: Definitely best viewed at night, this tree is a clear standout for its unique fairy dust approach to lighting. 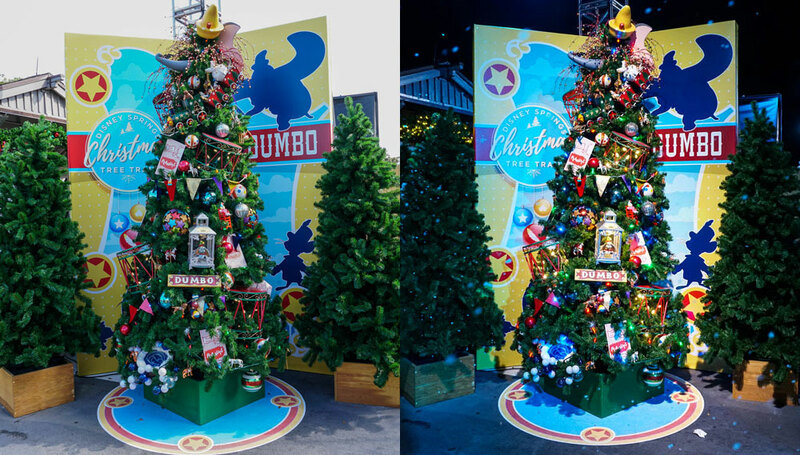 Dumbo: The multicolored lights really add to the circus spectacle this tree is designed around. 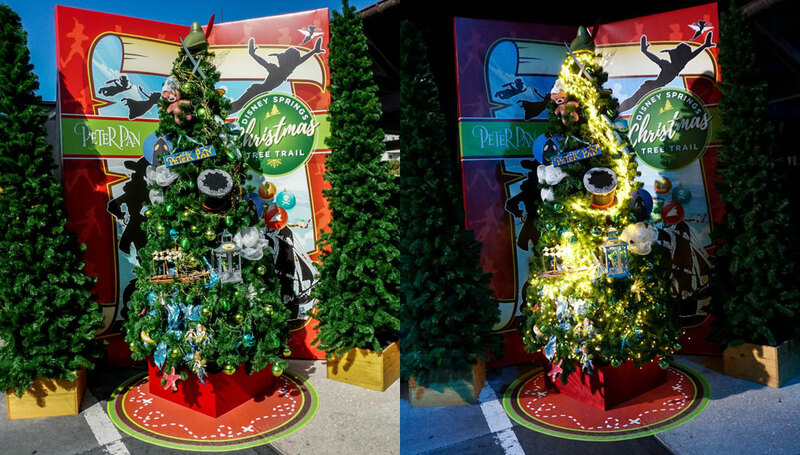 Pinocchio: Like many on the trail, it is the unlit ornaments hiding among the elegant lighting that bring real personality to this tree. 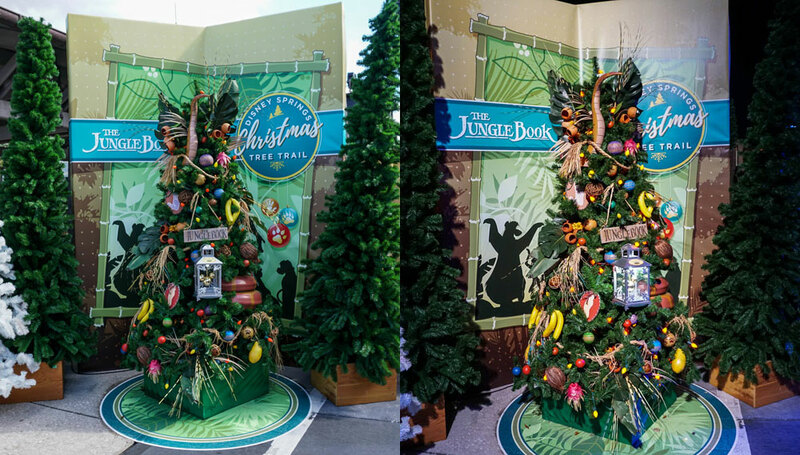 The Jungle Book: Speaking of hidden details, look for the python coils running throughout this tree. 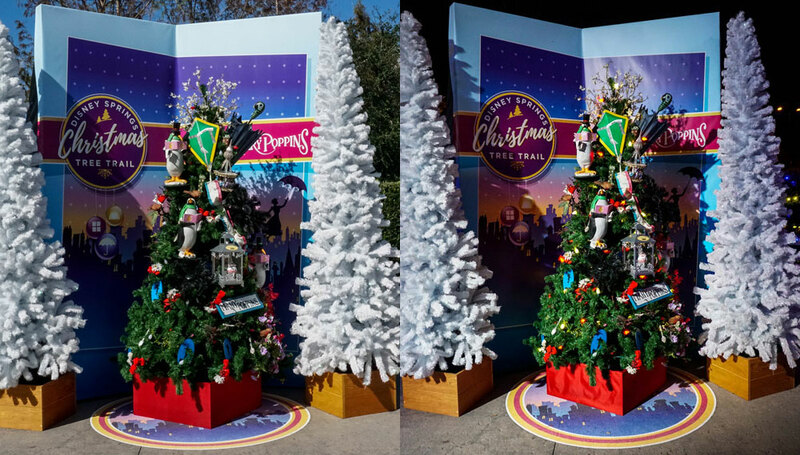 Mary Poppins: Although the tree itself is not much different between night and day, the white accent trees throughout the trail better evoke a feeling of winter when not under a blazing sun. 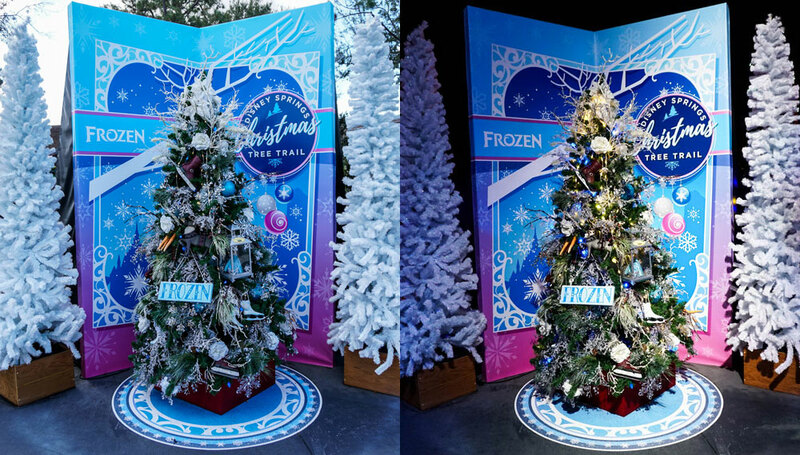 Frozen: Nothing brings about feelings of a cold winter more than Frozen, whose tree looks beautiful in the after hours. 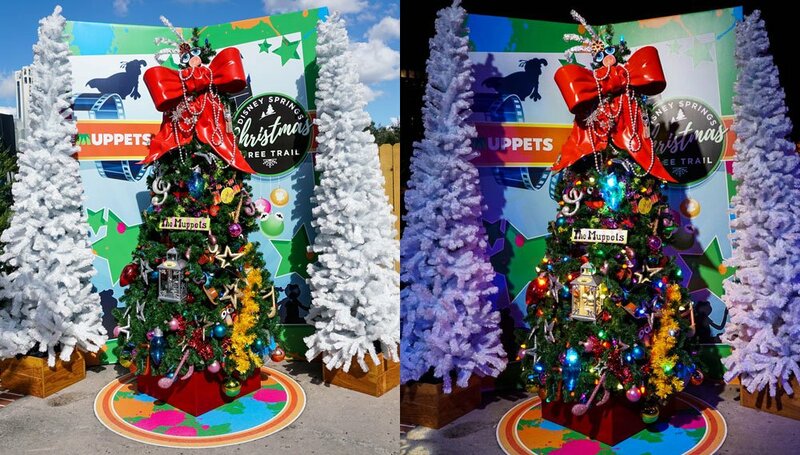 Muppets: With its gigantic bow tree topper and classic mix of character color, this tree is a must see once its many colored lights are visible. 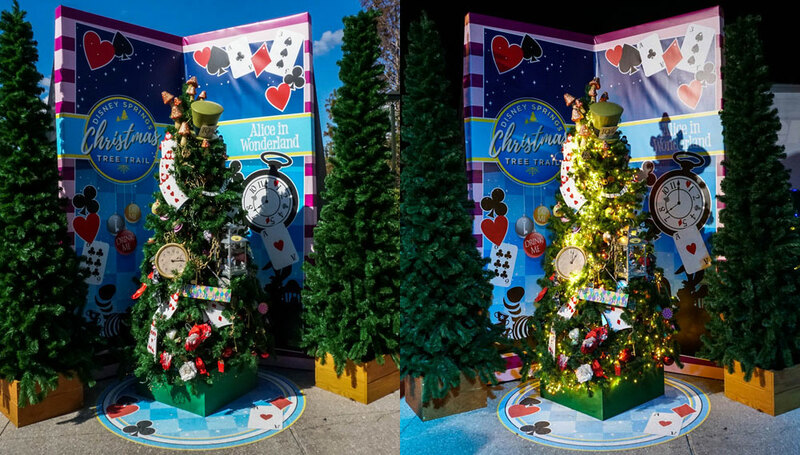 Alice in Wonderland: Fancifully lit and decked out in Wonderland memorabilia, this tree is even better at nighttime than at teatime. 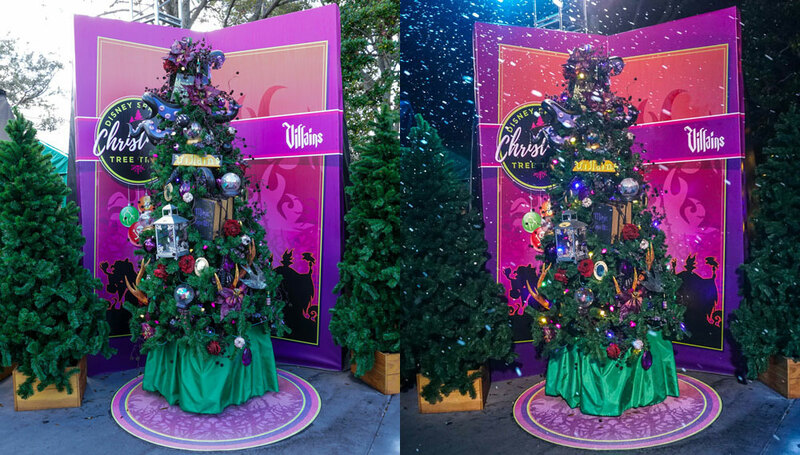 Villains: Topped with terrifying tentacles, this tree looks even better under some simulated snow. 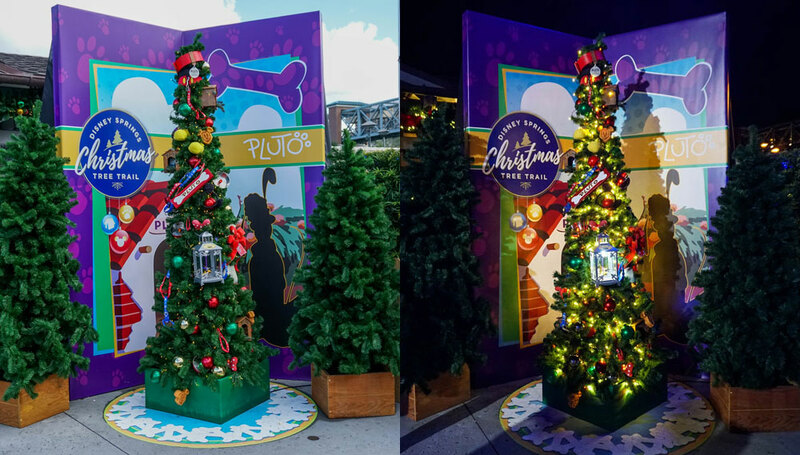 Whether due to heavy foot traffic or a highly confused tree enthusiast, these last four only have one image each. 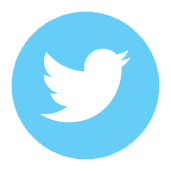 They can’t be excluded, though, because they are much too interesting to leave out. 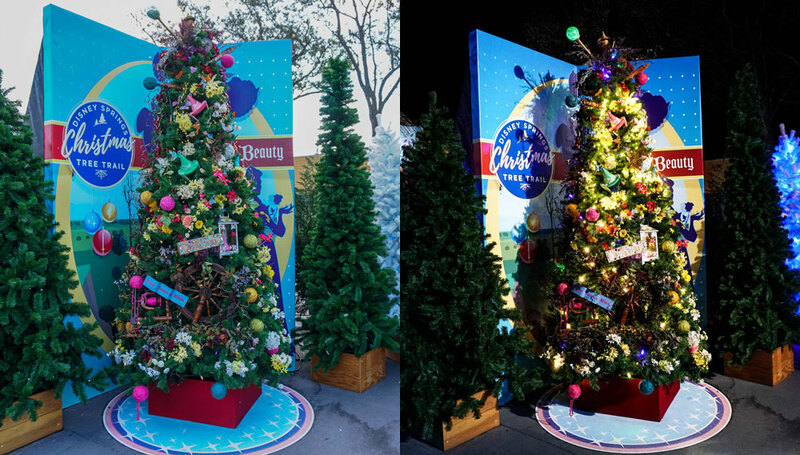 Mulan: Brass accents and a cherry blossom topper made this tree an eye-catching daytime view. 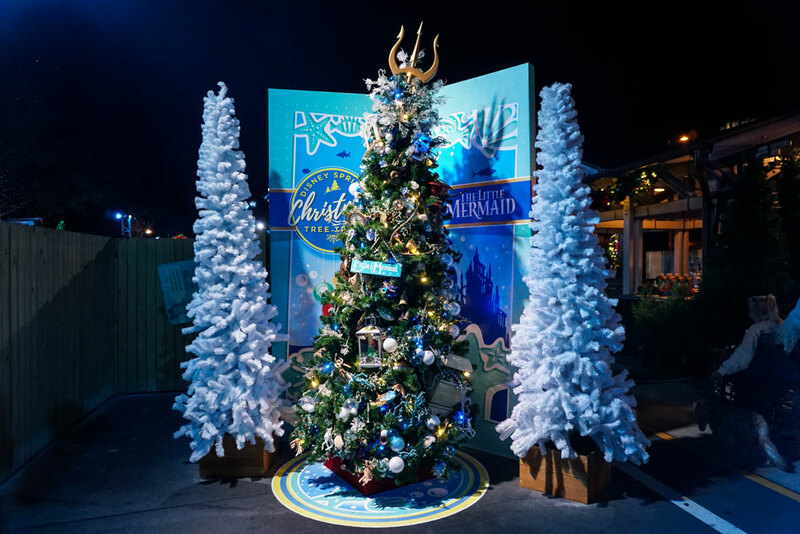 The Little Mermaid: Much grander than a seaweed, this tree is stuffed with sunken treasure and possesses an iconic and majestic topper. 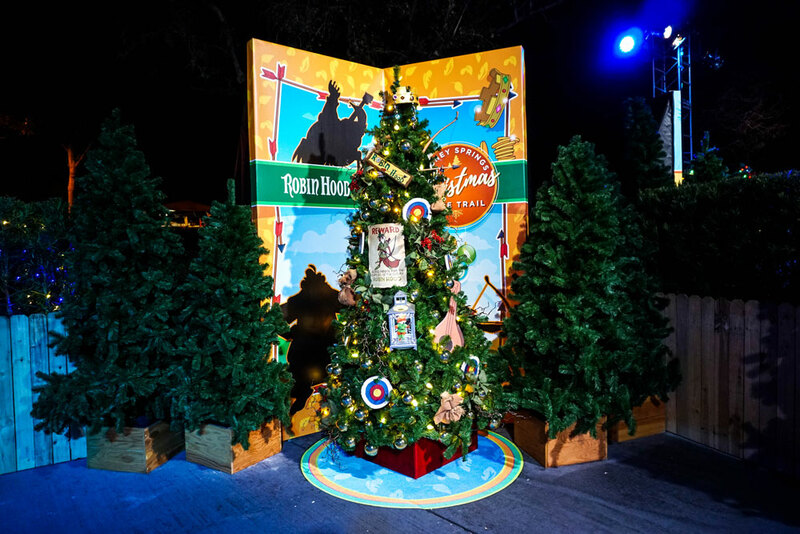 Robin Hood: Shipped straight from Sherwood Forest, this tree still has a reward for the hero affixed to it (one of my personal favorite decorations). Princess and the Frog: The purple and gold decorations are set ablaze by the lights into a spectacle of nighttime celebration. So there you have it. 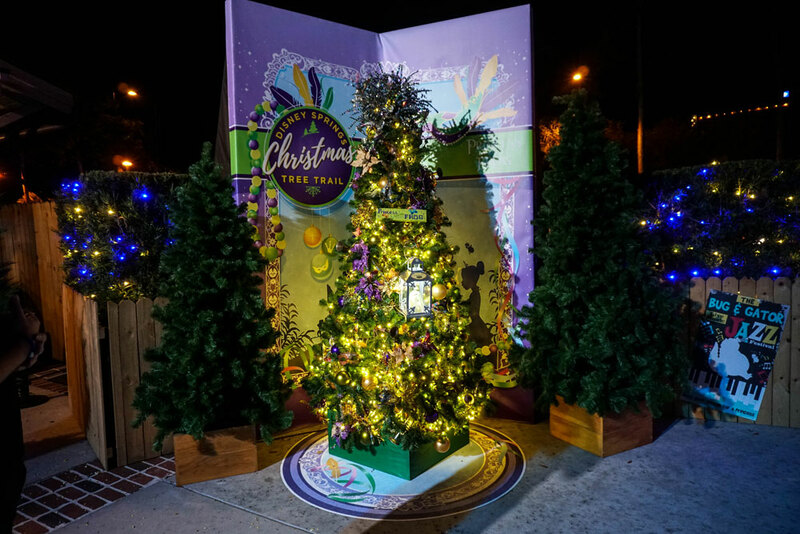 Hopefully, you now have a better idea of whether the Christmas Tree Trail is worth making a special nighttime visit for. At the very least, let’s hope these festive yuletide decorations helped bring a little holiday cheer to your day. 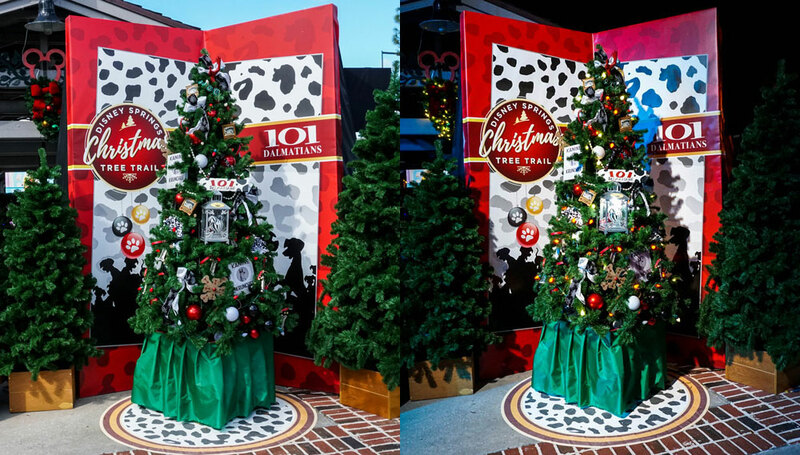 Magic Kingdom Christmas Decorations: A Photo Stroll Down Main Street U.S.A.